The first week of August marks World Breastfeeding Week and we thought what better way to celebrate than with a tasty Biscuits for Breast Milk ! In Chinese Medicine theory breast milk is an expression of the Blood energetic and Qi (vital energy). 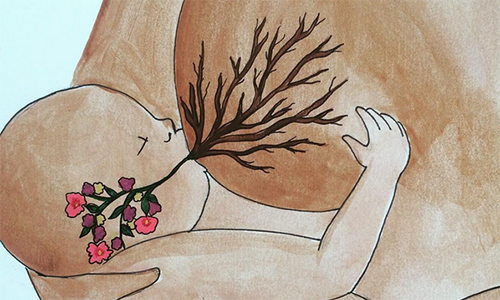 It is understood that once a baby is born the Blood that was once nourishing the placenta is now transformed into breast milk. Acupuncture, herbal medicine and a good nourishing diet all assist in stimulating and supporting milk supply. Have a look at our Breastfeeding post for more detailed information. This recipe is a quick easy way to get some tasty goodness into you. Have a biscuit with a big glass of water at each feed. It will keep those crazy hunger pains at bay and help boost your milk supply. Oats: These are a well known lactogenic food. High in saponins they impact the milk-marking hormones produced in the pituitary gland. They also contain antibiotic and anti-inflammatory properties which support the immune system reducing the risk of mastitis. Flaxseed: Contain phytoestrogens, a plant-based compound that can mildly mimic estrogen. Phytoestrogens are believed to have potential in helping to protect against a variety of health disorders, so they’re good for you whether you’re breastfeeding or not. In addition to flaxseed’s potential lactogenic properties, they are great source of soluble fiber which will keep your bowls soft and regular. Brewer’s yeast: A super healthy nutritional supplement that contains B vitamins, iron, protein, chromium, selenium, and a ton of other minerals. The high iron and B content is thought to the reason that many women say Brewers yeast help fight post-natal depression and improves energy levels. If you can’t get around to baking biscuits you can take 1-2tsp per day dissolved in water and still get the beneficial effects. 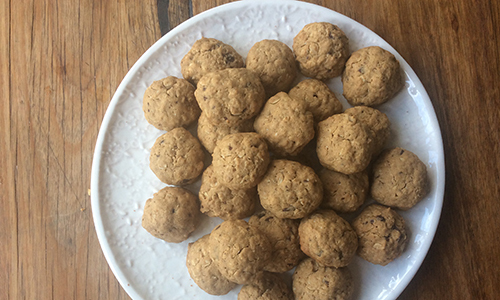 Using a spoon or your hands form the mixture into balls and place onto the baking tray. You can press them down with the back of a spoon/fork, or leave them as balls as shown in the picture. Some more reading on breastfeeding if you’re keen! Do Mothers Make Different Breast milk For Boys And Girls?